Disclosure: I wrote this post as part of a paid campaign with Martha Stewart Paints and Blueprint Social. The opinions in this post are my own. I may have entered into what is quite possibly craft nirvana, because Plaid Crafts sent me a huge box of Martha Stewart Paints, stencils, brushes, squeegees and applicators. 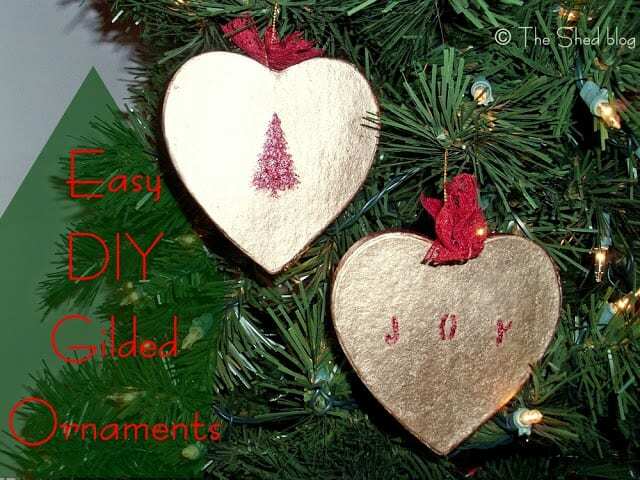 I will definitely be creating many of my Christmas gifts and holiday decor with these supplies, and today I’m sharing how I made a set of gilded Christmas ornaments. It is much easier than you may imagine! 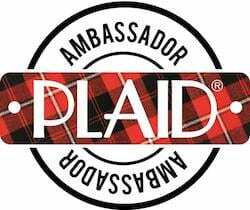 First, at the risk of making you swoon, here’s all of the supplies that Plaid sent! 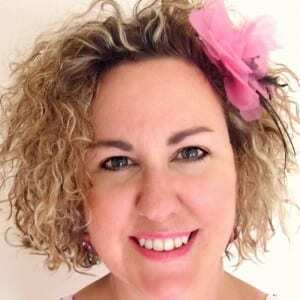 I have so many fun projects planned for you – for me – for us – to create! The Martha Stewart crafting supplies I received included many different types of brushes for stencils, glass paints and general crafts. Also included was glitter glue, crystal ice spray, glass etching creme, and two shades of gilding liquid. I. Am. Going. To. Have. So. Much. Fun. Crafting. This. Holiday. Season. These are the gorgeous Martha Stewart Paints I received! The glass paints (top image) include pearl, frost, gloss, metallic and glitter glass paints. The acrylic craft paints (bottom image) include two satin colors, and five course glitter paints. I’m in crafting heaven! Among the many stencils included for me to try were Martha Stewart Adhesive Stencils. 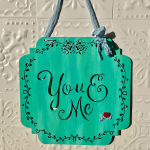 Because these stencils have a sticky back, they are easy to position and easy to remove, making it super easy to craft! Each package comes in a plastic sleeve, and includes helpful directions and tips. Make sure you work in a well-ventilated area: the liquid gilding is pretty strong as are most specialty paints. I did the gilding in our basement, away from people and pets. 1. 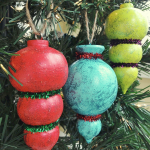 Spread out your paper maché ornaments and come up with a plan for how you want them to look. 3. Paint one side at a time, and wait at least one hour in between applying coats. I painted one side, set the timer, kept watching the timer, and couldn’t take it anymore after 40 minutes as I was loving how they already looked! I only did one coat on each side and along the edges. I let them dry on wax paper overnight. The liquid gilding felt like it just glided onto the surface. I painted it on in just one direction as the instructions suggested, and couldn’t get over how easy and quick it was to cover the ornaments. 4. This is how they looked the next morning, ready for the next steps. Plaid’s website states that Martha Stewart Liquid Gilding is a “one-step leafing paint [that] creates a rich metallic luster…” Oh how true this is! Just look at how pretty these ornaments already are! I already planned to use some of the adhesive stencils, and instead of regular craft paint I planned on using the course glitter craft paint. This was my first time using these paints, so I decided to see what the colors would look like on grey (for the silver ornaments) and tan (for the gold ornaments) cardstock. 5. Simply place the adhesive stencil of your choice in position and smooth it down so that no paint can find its way underneath the stencil. I had to position a few times, simply because each ornament didn’t hang 100% vertically from its gold thread hanger, and I can’t have crooked ornaments on my tree! 7. I carefully removed the adhesive stencil and took a moment to absorb the fact that it worked, it looked so cool, and there was No. Stencil. Leakage. At. All. Yay for me! 8. Once I stenciled JOY, I hung up both ornaments to dry for about an hour. 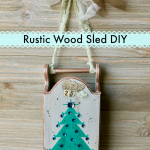 I hung them up using those twisty-ties you get on loaves of packaged bread, and hung them from some of my slatted shelving in my craft room. 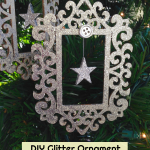 Once dry, I took them down and – using the same dauber – I pounced more of the Garnet course glitter paint onto the edges of both ornaments. Then I hung them up to dry again. 9. I loved how they looked, but wanted to add just a tiny bit more “oomph” so I cut three small strips of red vintage lace seam binding, stuck a straight pin through them and into the top of each ornament. I used a red permanent marker to color the top of each straight pin, and then fanned out the pieces as shown below. And there you have it: a set of gold gilded ornaments that will dress up our smaller Christmas tree that we put up in our library each year! 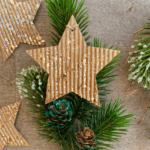 These ornaments could also be hung from a wreath, from a faux (or real) evergreen swag, or tied around bottles of eggnog, wine or as “gift tags” on your gift-wrapped Christmas presents. Lots of possibilities for Christmas gifts and holiday decor! Thanks so much Carol! It felt great to craft again after being away from it since Hurricane Sandy. Crafting is therapeutic! Cute! Awesome tutorial. I love the stipple brushes. I recently found a new birdcage stencil to try with them. Thank you Jenn! All the best to you and yours as well as we take time to give thanks and realize all we do have to be thankful for! So cute! 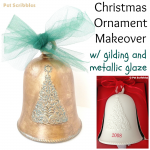 Love the pretty gilding! Wonderful idea, Laura! These would be perfect for teachers too. Adorable idea for ornaments. Thanks for sharing at Throwback Thursday.